Fitness, Outdoor items, Spa Kits, Gift Baskets, Golf, Wine Accessories and other. This gift will please the Outdoor Enthusiasts and Sports fans. Our Backpack Cooler has a built in Chair that folds up when not in use. The Backpack is made of a tough 420 Denier Polyester and 600 Denier Poly. 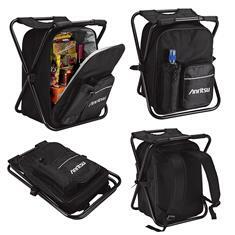 Features include padded straps for comfort, a front water bottle holder and a zippered pocket for storage. Imprint Area: 3.5" x 2.5"